Home » Blog » What Are PC/Compute Sticks? What are PC sticks? PC sticks–also known as compute sticks–are small pocket-sized devices that plug into your TV’s HDMI input port. 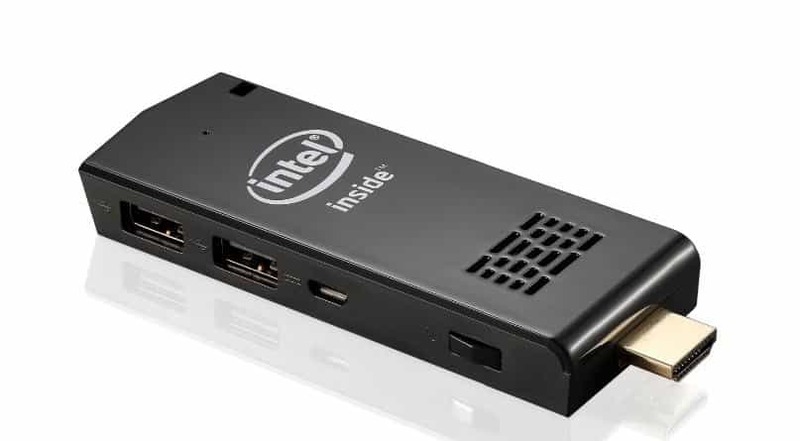 As the name implies it is a PC on a stick, complete with RAM/hard drive memory, integrated WiFi networking, USB and HD graphics controller. A stick will typically boot a standard operating system–like Microsoft® Windows®–and be capable of running standard application software. What are PC sticks used for? Most people buy PC/compute sticks for use as a media center, to stream video, watch Netflix and so on. For this reason most PC/compute sticks are able to smoothly display full motion HD video along with supporting WiFi Internet access for connecting to media services like Youtube or Hulu. What are PC sticks good for? The features that make PC and compute sticks great as a media center also make them great for digital signage. Instead of running a Netflix app you can install a digital signage player software program on your stick. Digital signage player software will download and display digital signage presentations on your TV. For this to work you need WiFi Internet access and the ability to display HD content on a TV screen. Fortunately, these are standard features of most PC and compute sticks. Of course you will also need a digital signage service–like PowerSignage™–that that stores/manages your digital signage content and makes them available for downloading and TV display. Another benefit of using a Windows-based PC or compute stick is its ability to display native PowerPoint presentations on your TV screen. Using PowerPoint for digital signage is especially ideal for small to mid-sized companies with limited IT and creative design staff. Most office staff already know how to use PowerPoint for creating and displaying high impact multimedia presentations. And when you think about it that’s all a digital signage display really is: a multimedia presentation displayed on a TV. For more information please visit our website at https://www.powerdigitalsignage.com. Microsoft and PowerPoint are the registered trademarks of Microsoft Corporation. PowerSignage is a trademark of Power Media Design Pty Ltd. All other trademarks are the property of their respective owners.